Trips for Kids Santa Cruz, an all-volunteer organization that takes kids mountain biking, seeks Ride Leaders and Marketing Content Publishers. If you enjoy mountain biking, mentoring kids, and feel that changing kids lives for the better is payment in itself, then you will fit right in with Trips for Kids Santa Cruz. To express interest in any positions, please send email to: info@tripsforkidssantacruz.org. Ride Leaders teach mountain biking skills and etiquette, act as nature docents, lead rides and activities, provide first aid for injuries, repair bikes on the trail, respond to emergencies, and above all enjoy working with kids and creating a safe and fun experience. Marketing Content Publishers take photographs, write up stories, record short videos, and publish content online—including Facebook, tripsforkidssantacruz.org, YouTube, and email newsletters—and print and physical media. Works with the Board to recognize sponsors, donors, contributors, and volunteers. President is the liaison between the local chapter of Trips for Kids and the International organization. President leads monthly Board meetings, and supports other Board members with their duties for the operation of the organization. President represents the chapter in all legal, fiduciary, and public matters. President coordinates activities with other bicycling organizations and events. We provide kids (ages 10-18) with everything they need to have a safe, fun experience riding a mountain bike in the great outdoors, all at no cost to them. We fit the kids individually with a bike, helmet, and gloves, and provide a healthy lunch, transportation, skills instruction, and moral support. Trips for Kids Santa Cruz is a member of Trips for Kids® International http://www.tripsforkids.org, a 501(c)3 nonprofit organization based in Marin County, California. Founded in 1988 and now operating in over 80 locations throughout the United States, Canada and Israel, Trips for Kids (TFK®) International has opened the world of cycling to over 100,000 at-risk youth through guided mountain bike rides and job training/earn-a-bike programs. All TFK chapters, modeled on the foundation of the original TFK Marin program, are managed and operated independently at the local level but share a common goal. Their mission is to use bicycles as a vehicle for lessons in confidence building, achievement, health, fitness and environmental awareness through the development of practical skills and the simple act of having fun. On November 21, we took nine girls and three leaders from Girl Scout Troop 10423 for a “bike and hike” in The Forest of Nisene Marks State Park. This was the second ride this year for this eager group of girls. Kathy Frank was our ride leader. They rode up to the Aptos Creek Trail along the fire road, and from there hiked to the Epicenter, and then up to the bridge crossing at Big Slide. Everyone had a blast, and they can’t wait to do it again. Below, is the thank you note from their troop leader Nancy Gere. On behalf of me, the girls, and adults who chaperoned today’s ride, thank you so much!! We loved it. It is so good for the soul to get out in the woods and go on an adventure! All the girls had positive things to say; even the ones who were tentative at first said they really enjoyed it. Thank you for coordinating this amazing day and for your flexibility with us this morning. We’re looking forward to the next ride! Trips for Kids Santa Cruz led riders and volunteers from San José ICO on the fire roads and single track trails in the Forest of Nisene Marks in Aptos. The day started off cool, and a few showers started to fall after lunch, making for perfect trail conditions. The leaders helped all the riders learn a few skills: shifting up and down, braking, and trail etiquette. The riders were well prepared with rain jackets supplied by San José ICO, keeping at the top halves of ourselves dry, even though everyone had a skunk tail up the back of the jackets. Toward the end of the ride, the showers turned into a downpour, and the forest canyon walls rang with peals of laughter. 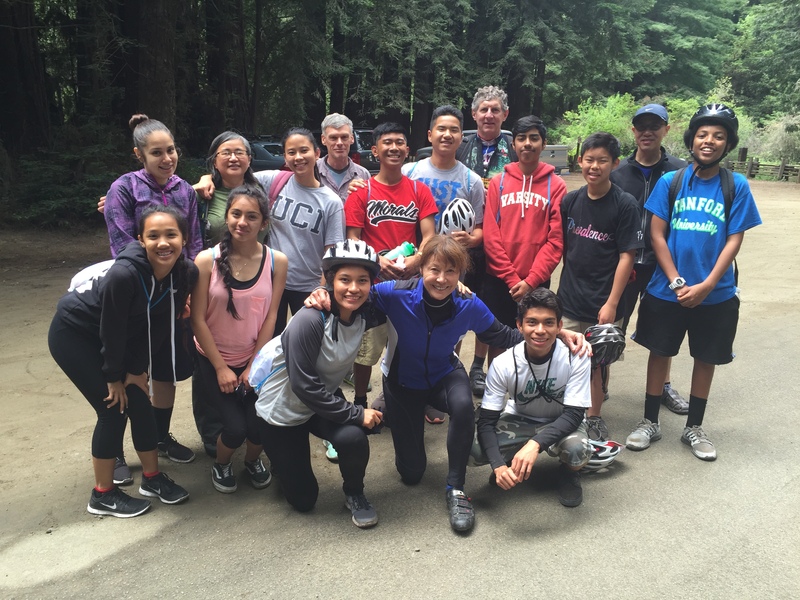 Our friends from San José Inspiring Connections Outdoors rode through the Forest of Nisene Marks last Saturday, June 6. Janette LaBau, Ray, and five other volunteers led eleven kids on an adventure they will always remember. Forest elves and the elusive Duckus bikerus accompanied us on our trip along the trails. A large group of kids from middle schools around the county rode through the Forest of Nisene Marks Saturday, May 30. Sunshine filtered through the redwood canopy and warmed us on our ride. At our lunch stop alongside Aptos Creek, a few of us learned how to skip stones, and others went “spelunking“. Tawn Kennedy and Steve Piercy led the riders from New Brighton and Mission Hill Middle Schools, and kids in the Earn a Bike program in Watsonville. Our bikes need some love and attention. We will hold a bike maintenance party to adjust brakes and shifters, lube chains and hubs, and other maintenance tasks. We’ll supply the pizza and delicious beverages, as well as tools and bike parts. Just bring your fine old self and some rockin’ tunes. Trips for Kids Santa Cruz will be holding a drawing for a Raleigh EVA 29 mountain bike. The generous Bike Station Aptos donated this awesome bike. View the full manufacturer specifications. More information about the drawing will be announced in upcoming newsletters, on our Facebook page, and our website. The folks from Bike Friendly Watsonville will hold their inaugural Community Bike Ride. The event is free and open to all ages and experience levels. For more information, see their Facebook page or contact May Pro-Tem Felipe Hernandez at 831-707-4392. Read the article in the Santa Cruz Sentinel, featuring our own board member Kym Lacrosse. Is it hard to ride your bike to your home or job due to steep hills, heavy loads, or long distances? Bike Station Aptos is hosting an e-bike demo day on June 27 at the Cabrillo Farmer’s Market, giving you a chance to see if an electric bike is for you. Bikes from Currie Tech, Kalkhoff, and Focus will be available for demo. Come out and try an e-bike on those steep Cabrillo College campus hills! We have a flurry of rides scheduled for the next several months. 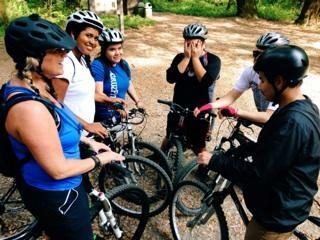 Our friends from San José Inspiring Connections Outdoors rode through the Forest of Nisene Marks last Saturday, June 6. Janette LaBau, Ray, and five other volunteers led eleven kids on an adventure they will always remember. Forest elves and the elusive Duckus bikerus accompanied us on our trip along the trails. We rode some single track and the fire road, with some technical riding through the creek. Along the way we stopped at the Buddha altar to pay our respects. It was an awesome, beautiful day and a whole lot of fun. Click an image in the gallery to view full size photographs of our trip. 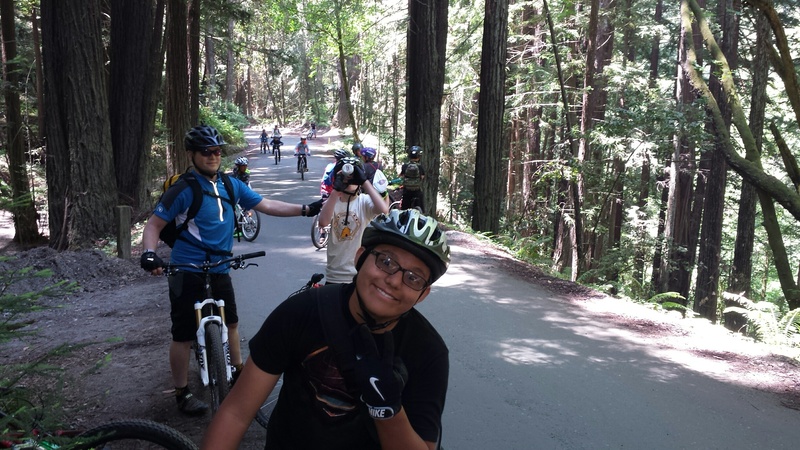 A large group of kids from middle schools around the county rode through the Forest of Nisene Marks last Saturday, May 30. Sunshine filtered through the redwood canopy and warmed us on our ride. At our lunch stop alongside Aptos Creek, a few of us learned how to skip stones, and others went “spelunking”. Tawn Kennedy and Steve Piercy led the riders from New Brighton and Mission Hill Middle Schools, and kids in the Earn a Bike program in Watsonville. 114 kids and adults who wish they could be kids again rode bikes through the bike skills obstacle course at Open Streets Watsonville last Sunday, May 17. Volunteers from Trips for Kids Santa Cruz partnered with Ecology Action’s Bike Smart! program to help kids practice bike riding skills. Kids learned how to signal for turns, how to cross railroad tracks, and how to slalom around hazards on the road. Trips for Kids Santa Cruz will be raffling a Raleigh EVA 29 mountain bike. The generous Bike Station Aptos donated this awesome bike. More information about the raffle will be announced in upcoming newsletters, on our Facebook page, and our website. Trips for Kids Santa Cruz will partner with Ecology Action’s Bike Smart! youth bicycle safety program to help kids learn on-street bicycle riding safety and basic bicycling skills at Open Streets Watsonville, on Sunday, May 17, 2015, 11:00 AM – 3:00 PM, on Brennan and Union Streets between Callaghan Park (on Freedom Boulevard) to the City Plaza in Watsonville. In addition to our bike rodeo, there will be music, food, raffle for prizes, and fun activities for the entire family. Dozens of kids got to practice bike riding skills with the help of our volunteers through our bike rodeo at the Santa Cruz Mountain Bike Festival, Saturday and Sunday, April 11 and 12. 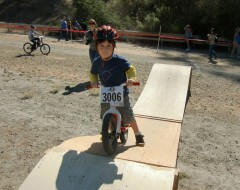 The kids attacked the ramps and terrain like seasoned professionals, even if their push bikes didn’t have pedals. Come volunteer for more fun at Watsonville Open Streets (see previous article). Click to watch this short video of the Santa Cruz Mountain Bike Festival which features our Bike Rodeo. 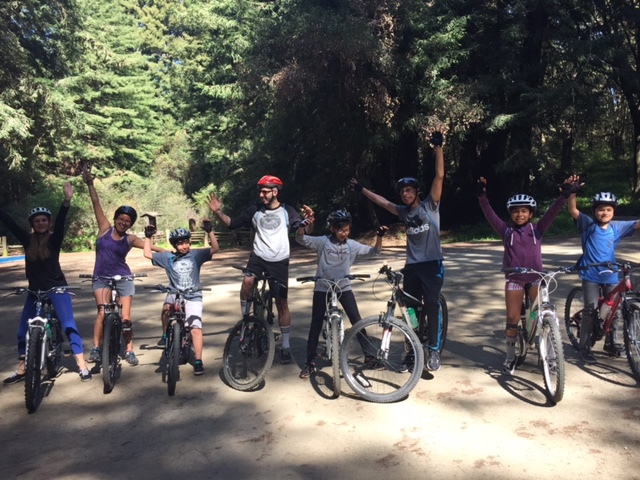 A half dozen kids and chaperones from the Watsonville Boys and Girls Club enjoyed a beautiful day and had a great ride into the Forest of Nisene Marks at the end of March. There’s a huge line-up of events taking place Friday, May 1 – Friday, May 8 during the Spring 2015 Bike Week. Bike stunt shows, live music, bike spin art, free helmets, bike rides, free breakfast, free bike maintenance, raffle prizes, bike store and restaurant discounts, and the list goes on and on. For a complete list of events, see the Bike to Work website. 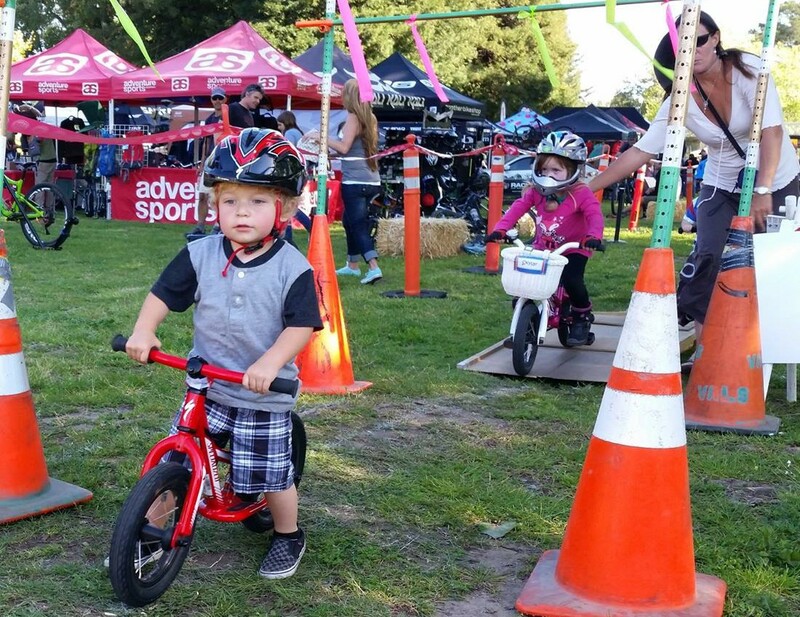 We will be teaching kids bike skills through a bike rodeo at the Santa Cruz Mountain Bike Festival, Saturday and Sunday, April 11 and 12. Volunteers will teach kids how to take on challenges by riding through the skills course, and will help fit and give out free helmets to kids in need. Eight volunteers recently participated in a training at the County Health Services Agency for helmet sizing, fitting, and safety education. TFKSC is now an official distributor of free helmets for Santa Cruz County residents who need them. We will give out helmets to our ride participants and people who ride in our bike rodeo events. The Santa Cruz County Health Services Agency (HSA) runs the free helmet distribution program throughout the county. Our Director of Technology, Steve Piercy, wrote an article about the program, Santa Cruz County Health Services Agency adds new free bike helmet site. Six kids from Jóvenes Sanos explored the Forest of Nisene Marks with Trips for Kids Santa Cruz on Saturday, March 21. Click to see the video on Jóvenes Sanos Facebook page. The following Saturday, March 28, five kids and three adults from Big Brothers and Big Sisters enjoyed riding the trails and roads through the Forest. Our volunteers are the heart of our programs, and to keep it beating, 6 more ride leaders got CPR and First Aid training at the end of February. Now over a dozen volunteers are trained and certified to administer CPR and First Aid on our rides and bike rodeo events. San Lorenzo Park, Santa Cruz, CA. This year’s volunteer-run festival will include bike demos, skills clinics, kids’ riding areas, a poker ride, aerial jump bag, vendor fair, beer garden, food court, bands, raffles, after-party, and much more. When we take kids on rides, we always have at least one volunteer Ride Leader who has taken First Aid and CPR training to administer when needed. The TFKSC Board will hold a CPR and First Aid Training for all volunteers who want to be Ride Leaders. Kids who participate in our bike rodeos and go on our rides will get to keep a helmet for free. We need volunteers to get trained to properly size and fit helmets, and provide safety education to helmet recipients, in order to make this a reality. Contact Steve Piercy, helmet@tripsforkidssantacruz.org, to sign up. If you head up the hill on Emeline Avenue (from Highway 1 North/Emeline exit or from Grant Street) without turning or veering in either direction, you will come to a beige building with green awnings. The Solarium is the room with all the windows at the top of the staircase farthest to your right on that side of the building. The Santa Cruz County Health Services Agency (HSA) runs the free helmet distribution program throughout the county. Our Director of Technology, Steve Piercy, wrote an article about the program, “Santa Cruz County Health Services Agency adds new free bike helmet site“. Thank you to San Jose Inspiring Connections Outdoors (ICO) for donating four bike racks and a bike mechanic work stand to TFKSC. The bike racks will increase our capacity to transport bicycles. The bike mechanic stand will double the number of bikes we can repair and maintain comfortably. ICO is a community outreach program of the Sierra Club dedicated to provide underserved youth and young adults the opportunity to discover the beauty of wild places, develop an appreciation for nature, and acquire the skills to enjoy these places safely. Please visit ICO’s website or Facebook page for more information. Our volunteers teach bike skills, provide moral support, and help kids meet challenges. They also tune bikes, secure donations, write grants, build community support, and make it all happen behind the scenes. Come share your time and expertise with youth and enjoy the smiles. Donating to Trips for Kids Santa Cruz changes lives through the mountain biking experience. As an all-volunteer organization, your donations go directly to benefit kids. We accept bikes, tubes, tires, water bottles, first aid kits, and any other mountain bike related necessities. Please Contact Us to arrange a donation of in-kind items.